Sponsored post by Mirum Shopper and Crock-Pot® Slow Cooker. All opinions are my own. Thanksgiving is around the corner and that means it’s time for another Crock-Pot® Slow Cooker recipe packed with healthy (duh) ingredients. Green bean casseroles are my hands down falbx.la/td6Fvorite dish at the Thanksgiving table. So much so that now I’m wondering why I never make it any other time of the year! From the crispy onions, to the creaminess of each bite, I’m hooked on the flavor and texture. Of course my family has always made their rendition of a green bean casserole to be hearty and fattening: extra butter, extra cream… extra everything that makes recipes taste ridiculously amazing, but may add to a muffin top if you go wild and eat half of the dish (like I do). 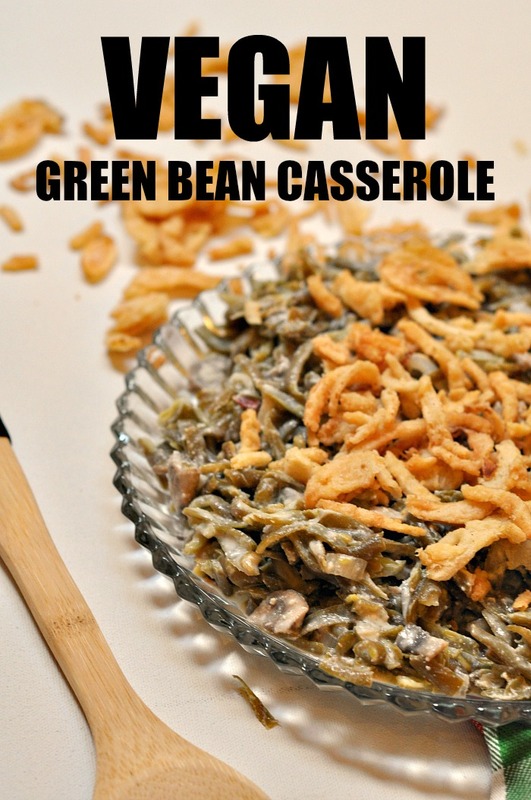 So because we’re all about swapping out fattening ingredients for more health-conscious ones here (without sacrificing flavor and texture), I’m sharing a vegan green bean casserole recipe that is dairy free but will still remind you of the classic Thanksgiving side dish. I’m making this casserole in the Crock-Pot® Slow Cooker to not only save me time while I’m creating additional recipes, but it also really allows all the flavors to bask together. I’ve been using the Crock-Pot® Slow Cooker about once a week now to prep meals and it allows me to create weeknight meals in bulk while also multitasking. I literally just throw the ingredients in there, set the heat on low and let all of the ingredients melt into a deliciously tasty concoction. Here’s the secret swap that takes this vegan green bean casserole dish up a notch on the health spectrum. Instead of a dairy based cream, I used cashew cream (no surprise there). Ya’ll know I’m crazy about cashew cream so of course I’m adding it to this recipe. As a reminder, cashews are the ideal cheese substitute when blended with almond milk and nutritional yeast. You can literally use it in any recipe that you want to give a cheesy creamy taste to. In a blender, combine the cashews and almond milk, and nutritional yeast and blend until smooth. Heat a skillet with olive oil or butter and saute the shallots and mushrooms. Cook on medium heat for about 10 minutes until the mushrooms shrunk in size. You are sauteing the mushrooms before transfering them to the slow cooker so that you can evaporate any water. This prevents the casserole from becoming soggy or watery. Add the cashew cream and vegetable stock to the skillet and cook on medium heat for another 5-6 minutes. Sprinkle salt and pepper to your preference (obviously don’t overdo it). If you have frozen green beans, defrost them in the sink. If you’re using fresh green beans, transfer them to the empty Crock-Pot® slow cooker and then pour the mushroom and cream mixture on top. Stir everything together to blend the ingredients well and cook on high heat for about 2 hours. The cool thing about using the Crock-Pot® Slow Cooker though is that there are automated smart cooking setting to help you out if you’re using it for the first time. Once fully cooked, transfer to a serving dish and enjoy! So there you have it! What are your favorite Thanksgiving recipes that you want to create healthier versions of? Sponsored post by Mirum Shopper and Crock-Pot®. All opinions are my own.